Does your child appear to be shy, but you have a feeling that it is more than shyness? You may have actually observed her freezing up and not being able to speak in certain situations or with specific people even though they have an adequate ability to speak and also have appropriate language skills to make sentences. This is selective mutism. Selective mutism is a specific fear of talking; the current belief is that it is an anxiety-based disorder. Therefore, a team including a psychologist or psychiatrist and a speech pathologist often work together with the client and family to improve skills. The school situation is one of the most challenging for them. • The individual’s awareness of their difficulty. • A hierarchy of situations and people that are difficulty difficult for them to interact with and work toward the individual be able to progress with these challenges. • Verbal processing speed and flexibility of responding in different ways. • Active listening and a stronger grounding in conversation skills. • Reading others non-verbal clues and giving non-verbal feedback to others. • Family education and assistance with interacting. Dr. Parker has experience working with individuals with the unique disorder of Selective Mutism. Call The Brain Trainer today (704-541-1373) to start your evaluation. Where Should Parents Draw the Line Between Sports and Education? So, you’ve noticed that your child is having difficulty reading or performing in math. At first, you think the school will be able to remediate the problem with their resources. However, with various trials, no positive outcome is forthcoming and your child is getting frustrated. When you were young, you had similar problems, but were able to overcome them. It worked out fine for you. Your child should be okay with time, and besides, he’s way too busy with soccer practice and the new travel team to try to fit anything else into his schedule! But, it’s been several years, and the gap between his and his peers’ academic performance is getting wider. Mikey is a really great soccer player and his travel team coach said he shows great promise for not only making the high school team, but for getting a scholarship to play in college. Do you hire a Speech Pathologist/Cognitive Specialist to work on his learning struggles or do you use that money to pay a coach to help your kid “go to the next level”? Before you answer that question, let’s consider the percentage of athletes that actually play high school sports and then move on to play college sports. Here are two charts found on the NCAA.org. The actual page on which the charts can be found is: https://on.ncaa.com/1QRZOA2. 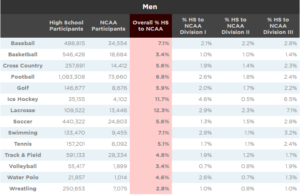 Reviewing the charts, it seems obvious that the percentage of men that move on to college level sports is less than 15% and is more often, in the single digit percentages. 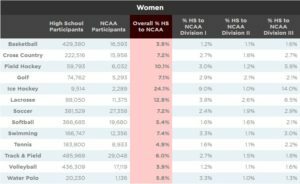 With women, there is a higher percent that if, they played in high school sports, they could move on to participate in college level sports. But, the percentage is still less than 25%, and more often, in the single digit percentages. These percentages drop significantly when these athletes try to move on to professional sports. The likelihood of an NCAA athlete earning a living as a professional athlete are between .9% and 9.5%. The full chart and methodology can be found at: https://on.ncaa.com/21wK3jx . In contrast, the likelihood of an NCAA athlete earning a college degree is significantly greater; graduation success rates are 86% for Division I, 71% in Division II, and 87% in Division III. What is it that determines if your child gets to play at the college level? Surprisingly, it’s not all raw talent. If you listen to several college coaches, they are not interested in athletes who are all about themselves, rather than their team. They want athletes who are passionate about the game or competition, want to help their team, want to be a better player and are willing to give their heart and soul to the sport and team. As a former NCAA DII Cross Country coach, I (the author) looked for athletes who loved the sport, had their heart in it, wanted to do the things that were best to keep their bodies in top form, and performed academically. As you can see from the charts above, there are thousands of runners that we can consider bringing into our program with athletic scholarship money. Your kid is just one of them. To get a scholarship and practice in the first year at a NCAA Division I school, incoming freshman must meet a series of academic requirements outlined in the table below (found at https://on.ncaa.com/1CxbYmm) . These academic requirements were changed to help make students more prepared to do college-level work and to improve graduation rates. If this minimum is not achieved, the athlete will not be permitted to participate in their selected sport regardless of how good they are. What I’ve observed with my runners is that the ones that are focused, with great organization, study and time management skills, tend to be successful at athletics and academics. It shouldn’t even be a question of if you are going to get your child the speech language therapy or cognitive skill development he needs; it should be a question of when. Your child needs to make it competitively through academics to be successful in life. After high school, your child will need to pick a college, regardless of whether or not he or she participates in sports. After college, your son or daughter will need to have a job that can support his/her expected lifestyle. The chances of making it into professional sports is minimal, so it’s important to ensure that their education and the ability to present themselves to obtain a good job is of paramount importance. I know you see your child as a star, and he/she may be. But, chances are low that their selected sport will be their vocation. Many people get to do the job they LOVE; but not many are sports stars. Jennifer was a Division 1 runner at the University of Pittsburgh. She graduated in 1992 and had dreams of running in the Olympic Marathon one day. Unfortunately, Jennifer was hit by a fuel tanker truck while she was on a training run in February 1993. She was fortunate in that, if you have to be hit by a big truck, at least a Police officer saw it happen, the EMT station was right across the street and the Trauma Center was only 10 minutes away. Those circumstances probably saved her life. At that time, she was an Assistant coach at Duquesne University, but soon had to resign the position because the recovery from the traumatic accident required 16 operations and nearly 5 years of physical therapy. The doctors said she would never run again; Jennifer said she would and does! Not at the competitive level she once ran, but at least she has gotten back to the sport she loves! Jennifer coached track at Hickory Ridge Middle School for 2 years (2011 – 2013). She followed her daughter to Hickory Ridge High School and was the Assistant Coach for one year (2012 – 2013), then promoted to the Head Coach position for both, the Cross Country and Track teams, for 4 years (2013 – 2016). Jennifer also coached Cross Country at Catawba College, a Division II college, for 3 years (2015 – 2017). Jennifer was the Head Coach of a USATF (USA Track and Field) club team, Harrisburg Runners, for 4 years (2011 – 2014). The team was ideal for athletes between 6 – 18 years old , who wanted to run Cross Country and/or Track and Field. Jennifer is a Level 1 Certified Coach with USATF, she’s attended many classes and has done research on how to train athletes in an effort to be a better coach. The most tangible result of our daughter's time at The Brain Trainer has been how much more quickly she finishes her assignments. (View More) Amy W.